At Prevent Dental Suite, when we open your mouth for a checkup, we are also trying to open up a window to improved general health! Let’s take a look at some of the things that the professionals at Prevent Dental Suite are looking for when they look inside your mouth. Oral cancer. The first symptom of oral cancer is often a small white or red spot or a sore in the mouth. The sore can appear in multiple locations including gums, lips, cheek lining, tongue, and in the soft tissue lining the mouth. Many times this goes unnoticed as it begins toward the back of the mouth or under the tongue – places that are very hard to see. 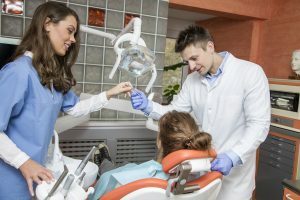 Dental checkups increase the chance that potentially precancerous or cancerous lesions get caught early when they are easier and cheaper to treat, and when chances of success are highest. Be to tell your Prevent Dental Suite dentist if you’ve noticed symptoms like lumps, numbness, pain, or sores that don’t heal on your lips or in your mouth. Bad breath. In most cases, bad breath is mere ‘halitosis’ caused by lifestyle or dental habits. These cases are easily treated and Prevent Dental Suite is happy to suggest how to make halitosis go away. But we are also looking for strange smells, “fruity” or “fishy” ones that can mean more systemic problems. In these cases, the first thing we do is rule out the odour coming from the teeth and gums. If the problem seems to be a non-dental one, Prevent Dental Suite will refer you to a specialist to get the cause identified. Celiac disease. If you have celiac disease, eating gluten (a protein found in wheat, barley, and rye) causes your immune system to attack your small intestine. Even though the condition is in your stomach, symptoms can often be identified in your mouth. You or your dentist might notice problems with tooth enamel, frequent canker sores, or a dry or burning feeling on your tongue. Gum infection is a common symptom of diabetes, and a dentist often has an up-close view of how well diabetes is being controlled. When diabetes is poorly managed, there is more gum inflammation and more abscesses in the mouth.” A dentist may also find thrush, an infection caused by a fungus, growing in the mouth. Diabetes makes dental care more difficult, so Prevent Dental Suite recommends more frequent dental checkups and cleanings for diabetics. Stress can lead to a wide range of mental and physical issues, but the specific symptoms are often vague. In some cases your dentist can help identify your stress, as the state of your mouth may indicate how much of toll stress is taking. While stressed, many people grind their teeth—a condition called bruxism. This will be noted during your checkup, and your dentist will discuss possible treatments/solutions with you. A customised night guard from Prevent Dental Suite may help. Nighttime reflux or GERD. If your dentist sees an erosion of enamel on the insides of teeth, particularly the upper back molars, it may be a symptom of gastroesophageal reflux disease (GERD). Because GERD occurs primarily at night, you may not be aware of it until your dentist points out its effects on your dental health. GERD can also cause erosion of the esophagus and even lead, eventually, to esophageal cancer. Osteoporosis. Osteoporosis is a bone disease that sets in when bone breaks down, the body makes too little bone, or both. Bones weaken and may fracture from a fall or even minor bumps or sneezing. Osteoporosis is most common in the elderly and post-menopausal women. Osteoporosis leads to changes in the jaw bone. Your dentist may first notice loose teeth or a receding gumline. Because these issues are so dangerous, and because Prevent Dental Suite can be your first line of defence, it is critical to your health that you have regular checkups. Give us a call at Prevent Dental Suite! Prevent Dental Suites is comprised of dedicated dental professionals who provide gentle and patient-oriented care to offer the best-quality dental service, including thorough checkups, from the moment patients enter into our office.